After volunteering weekly for over a year, this past January dedicated regular Garry Schuman opted for a new kind of Habitat experience. 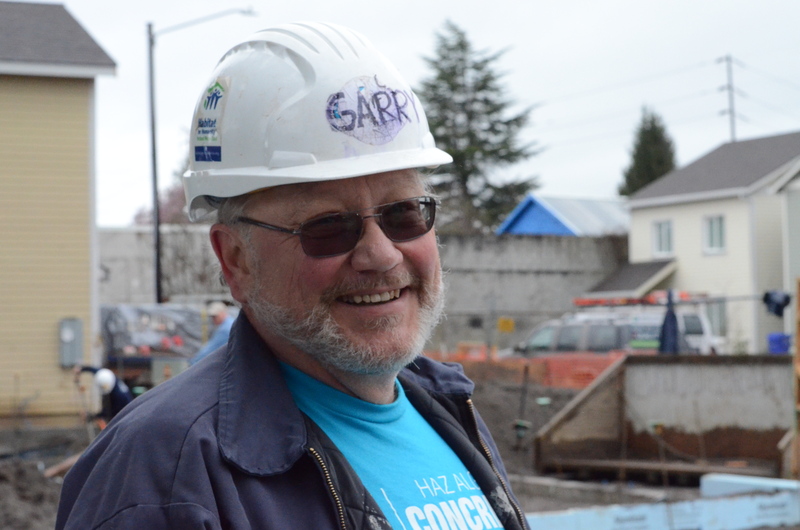 Leaving Portland’s gray skies behind, Garry joined Habitat staff, board members, friends and spouses on his first Global Village volunteer trip to our sister affiliate in sunny Guaymango, El Salvador. Over the course of two weeks, Garry and his team worked side by side with El Salvadorian Habitat staff and the future homeowners to help construct a one story, single family home. To prep the house’s foundation, they dug deep trenches in the hard sunbaked dirt using shovels and pick axes. “The work was not easy, in fact many times it was hard, demanding, and challenging,” Garry admitted, “but we helped each other, supported each other and encouraged each other.” This teamwork created a sense of camaraderie that stuck with Garry. At the end of the trip everyone gathered together in celebration of hard work and new friends. The El Salvadorians showed the volunteers how to make their national dish, pupusas—delicious corn tortillas filled with cheese and beans. Like many Global Village volunteers, Garry took the opportunity to explore his host country’s dynamic culture and history. After a tour of a coffee processing plant and a jaunt to volcanic hot springs, Garry traveled up through Guatemala before heading home to Portland. Although officially retired from his career in project management and commercial refrigeration repair, Garry enjoys keeping busy. When he’s not volunteering with Habitat—locally or internationally—he spends his time camping, fishing, traveling and hiking. He also collects gently-used kids’ life jackets and donates them to Safe Kids, a program that places these life-saving devices at popular boat ramps for public use. Habitat’s Global Village program offers a myriad of volunteer experiences in 40 different countries. To learn more about these unique opportunities, visit https://www.habitat.org/volunteer/travel-and-build/global-village.